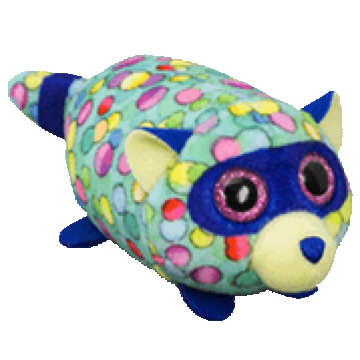 Rugger is a tiny pale blue raccoon covered in a multi-coloured spot pattern. He has purple glittery button eyes on a dark blue mask and a blue nose on a pale green muzzle. His tiny feet are dark blue and he has a band of blue on his tail. The three variations of Rugger are this blue mask version, a purple mask version, and a red mask version.